Let Us Make Your Travel More Convenient & Comfortable. You’ll be surprised that we can actually cost less than a cab, and provide a much more comfortable experience. Missing your flight or running late causes too much anxiety. We keep things tightly on schedule to give you peace of mind. Call 908-322-3100 to Get a FAST Quote At a GREAT PRICE Now! 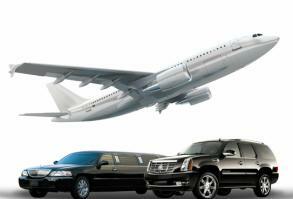 An airport limousine, or limo, is an effective, safe and affordable way to travel to and from the airport. Travelers often overlook the fact that limousines are a viable means of travel because it is often assumed this mode of transportation is more expensive than cabs. This is just not true. At times, hiring a limo service is cheaper than taking a cab to and from the airport. It does take a bit of planning to hire a limousine, as the traveler will need to schedule the time the driver needs to arrive to deliver their passengers or pick them up from the airport. A limo cannot be hailed on the spot in the same manner as a cab can. Limo drivers are, however, highly trained to take special care of their passengers. Cab drivers are not always reliable in nature. A limousine service also is quicker than taking an airport shuttle that could stop multiple times along the shuttle’s route. The driver will greet the traveler at the baggage claim area of the airport. This chauffeur will have a sign with the name of the traveler on it and a luggage cart to help the person with whatever luggage came along with him on the plane. The driver will tell the traveler his name and assist in finding the luggage as it comes through the baggage carousel. At times, the traveler prefers to meet the limo at the curb it is often up to the traveler to ask where the driver is to meet him. The airport limo arrives at the traveler’s house or designated location such as a hotel shortly before the required time. This allows the driver time to introduce himself to the traveler and load whatever baggage the traveler is taking on the flight. The limo driver will ask about airline flight information so he can deliver the traveler to the appropriate drop-off point at the airport. Limousine drivers typically know the fastest routes to the airport, but may ask the traveler if there is a route that is preferred over others. Once at the airport, the driver will deliver the traveler to the right area of the terminal, unload any luggage and even obtain the services of a skycap for the traveler when necessary.